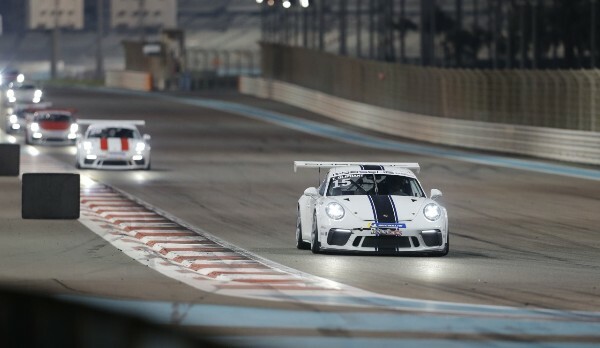 Britain’s Tom Oliphant has boosted his chances of a first series win in the Porsche GT3 Cup Challenge Middle East by winning the second race of Round 4 at Yas Marina Circuit in Abu Dhabi. The fine victory extends Oliphant’s lead in the championship to 19 points with only four races remaining in Season 9, after nearest challenger Al Faisal Al Zabair of Oman could only manage seventh place finish. A comfortable Oliphant was followed over the line by Dylan Pereira of Luxembourg in second and Dutch driver Charlie Frijns third after being gifted the opportunity for the win on the opening lap as those around him clashed. By his own high standards Oliphant endured a frustrating qualifying session to qualify in third on the grid, behind previous race winner Dylan Pereira, who started in pole and close rival Al Faisal in second. But any sign of disappointment was soon forgotten as Oliphant made a strong start to take advantage of a crowded first lap in which he catapulted himself into the lead ahead of Pereira and Al Zubair on the back straight. While engaged in their own battle for first place the duo of Pereira and Al Faisal managed to outbreak themselves to leave the door open for Oliphant to nip through and steal the lead. A position he didn’t relinquish until the chequered flag, winning by a margin of 1.215 seconds. In contrast to Oliphant’s race, Al Faisal had a race to forget finishing seventh. But it could have been worse. Entering lap 2 of the twelve-lap race the Omani was at the very back of the field after spinning out. A spirited performance from this point saw a heroic comeback, as Al Faisal picked off victims lap by lap to show the best of his racing. After the race he said: ““It hasn’t been the best of weekends for me unfortunately. Yesterday I had problems in qualifying which saw me start further down the grid, today I had a better qualifying session and started the race from second place however didn’t get the best of starts and was down into third by the opening turn. I found myself in a battle with Charlie Frijns and on the second turn there was contact between us, I span out and dropped to the back of the race. Off the podium finishers, much of the dramatic action in the race involved a frantic midfield battle with as many as seven drivers fighting for positions from fifth to twelfth, all tightly packed in close succession. Oman’s rookie racer Khalid Al Wahaibi highlighted his undoubted talent with a career best fourth place. Fifth went to the ever consistent and impressive young Frenchman Jean-Baptiste Simmenauer and sixth to UAE-based Glynn Geddie of Scotland. Drivers and fans now have slightly over a month to wait before returning to action as the Porsche GT3 Cup Challenge Middle East enters the all-important final two rounds, both to be staged at the Bahrain International Circuit. The penultimate Round 5 will take place on the 16th & 17th March before the series comes to a thrilling conclusion as an official support race for the 2018 Formula 1 Gulf Air Bahrain Grand Prix.